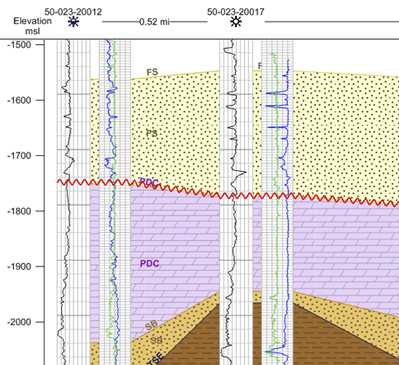 Display the logs in the cross section as inclined according to their deviation data! In most industries vertical boreholes are the stuff of legends. Strater 4 recognizes this and allows you to show the true path of your borehole in the map view. Show the true deviation path of your boreholes on the map view. It’s never been easier to add combine data from a multitude of sources to create the most informative maps possible. Now that Strater supports Golden Software’s full coordinate system library, you can mix and match data from different coordinate systems, giving you tremendous flexibility and times savings when creating your maps and displaying cross sections in the desired units! 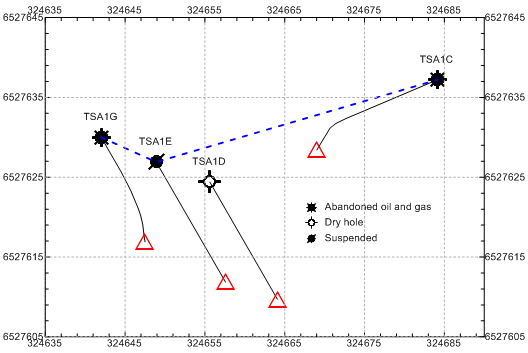 Don’t have lithology data for your boreholes? Not to worry! 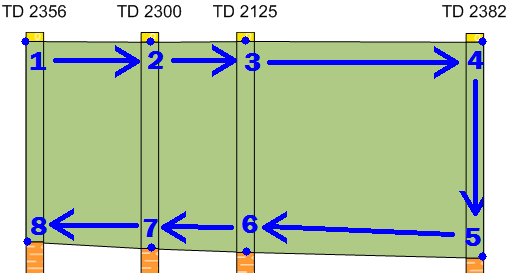 Strater 4 allows you to create a cross section from line logs. Add or import layer marks to indicate the layer picks, and then specify if they are the tops or bottoms of the layer. If you’re not happy with the default cross section layers that Strater creates for you, delete them and easily and quickly create your own layers! Customize your cross sections using your years of experience to guide you. With a few simple clicks you can create manual cross section layers that reflect what you know to be true about the subsurface. Compatibility with Voxler is now even better! Utilize the stunning 3D visualization of Voxler to show your well paths and volumes. Pick your pages: only show the header or footer on the first page, last page, or on all pages in the view or when you print. Draw an unconformity between different lithologies in any view! You have complete control over the amplitude and wavelength of the waves. Draw unconformable contacts between lithologies in your borehole (left) or cross section (right) view. Add horizontal scale bars to your cross section, and change the display units! Templates are easier to use! Open a template and import the data for all tables immediately! When you click OK, the log is exactly what you need without spending extra time importing data into all the individual data tables. Change the units in the cross section well header or the scale bar! You have full control over the units displayed in the well header and scale bar in the cross section view. As long as the map has units defined, you can convert the units (even lat/long!) to any other units such as meters, feet, miles or kilometers to display on the cross section. Do you want all your logs exactly next to each other? The space objects commands now work on more than 2 objects at a time! Set all your logs exactly the same width apart! No more painstaking math to calculate the position of each log, or inaccurate eyeball spacing! Specify the width of a linked text object, and any text that exceeds that length is wrapped to the next line! Creating an exact copy of a borehole view in your project is easy with the new view-only template! Previously, you could only save as a full template, complete with data tables and all views in the project. If you only wanted one view, you would need to delete all the extra information after the template was loaded. Now you can save only a single borehole view as a view-only template; no data tables, no extra views. Just save the view to the view template, open the view template, assign the existing data (or choose to import new data), and the copy is created! Save a single borehole view to a view-only template file! No data tables,no extra views; just the information you need. Specify the angle of the hole as either inclination or dip! Previously, you could only use inclination. Don’t modify your data to work with Strater, choose to let Strater handle your data as it is! Set the Reference Datum in the borehole view to hang the view on mean sea level or a marker bed. Format numeric text labels in complex text logs, zone bar logs, bar logs. Group objects and logs together in the log pane. Depth logs and scale bars can update the minimum and maximum values automatically, but you get to choose the interval of the major ticks. Create text logs from depth data tables and the text is located at the depth specified. View the XY units of a map in the status bar when you move the cursor over the map. Open multiple data files into new data tables at once. Import multiple data files into an existing data table at once. Apply a mathematical function on the data in the data tables. Format numeric linked text objects. Set the width for all objects at once.